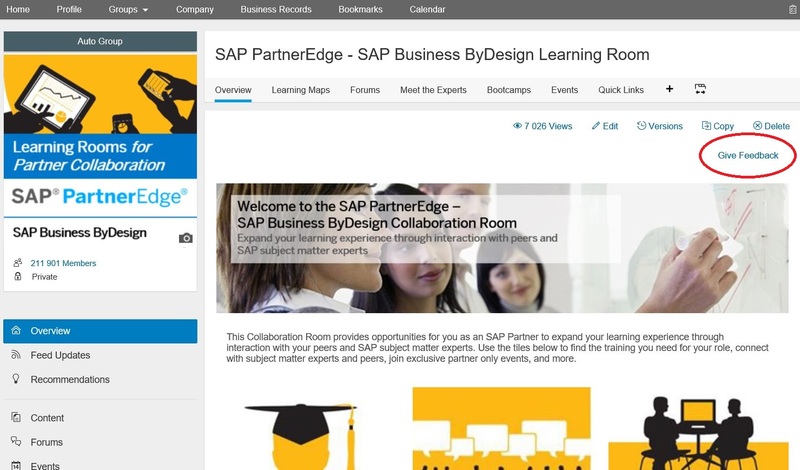 SAP Learning Rooms for Partner Collaboration – What do you enjoy most? What should we improve? Collaboration Rooms are an essential element of our Digital Partner Enablement Platform, available exclusively to SAP partners. They are the social collaborative environments that connect partners to their peers, and to SAP experts. Follow live feeds to see all room activity, join forums for business critical discussions, and have your questions answered in real-time. Collaborate and engage with subject matter experts and attend virtual live sessions. We would like to thank you for your engagement and your active participation in our Collaboration Rooms. To help us improve your end-to-end partner enablement experience, we invite you to click through to take a brief, anonymous survey. Access the collaboration room of your choice and select the “Give Feedback” link above the welcome banner picture. Five minutes is all it takes. Thank you for your time and your feedback!